Top priorities for the new chief executive of Spirit Airlines are improving operations and customer service, areas where the company has lagged far behind its US airline peers during the last couple of years. As US competitive dynamics change, those two factors are becoming distinguishing factors for succeeding in an environment where falling fuel costs are, for the foreseeable future, keeping fares low. Although Spirit has no plans to match the 30% expansion in capacity that it recorded in 2015, management still believes that a growth rate of 15% to 20% is reasonable. However, it appears that the airline seems poised to make some nuanced changes to its network strategy by focusing less on large markets and evaluating more mid-sized markets. Depending on the changes that occur, the composition of Spirit’s fleet could look different in five years, compared with today. In the short term, Spirit has not observed further deterioration in the US pricing environment; however, it has not experienced marked improvement either. As a result its unit revenue revenue performance in 1Q2016 will likely mirror the 16% decline the airline posted in 4Q2015. Data from the US DoT show that Spirit’s on-time arrival rate from Jan-2015 to Oct-2015 was 68%; its on-time departure rate was 71%. In Oct-2015 Spirit had the worst on-time arrival rate among airlines tracked by the agency: 78%. Mr Fornaro seems to understand that delivering a consistent favourable operational performance is key to Spirit competing with its larger rivals. “...as those carriers come down to let’s say match us [in price] I think what they are going to see is a corresponding improvement in our operation”, he explained during a recent discussion with investors. Prior to Mr Fonaro’s appointment, Spirit had started taking steps toward improving its operational performance. 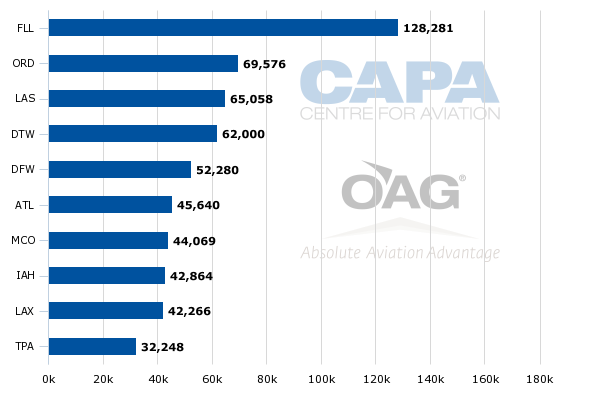 For 2016 it plans to reduce aircraft utilisation in peak periods, and has already made adjustments in staffing and operating systems. For the full year 2015, Spirit’s average daily aircraft utilisation was 12.7h. Changes to Spirit’s network structure could also help to improve its operations, and lessen its exposure to larger airlines such as American, Delta and United that are now focussed on competing with ULCCs that enter their markets. Over the last few years, Spirit’s strategy has centred on entering large hub markets with one to two flights per day, in theory to stimulate enough demand to cover the capacity it adds on a given route. Spirit reasoned that those major airlines were not concerned about chasing the low-yielding passengers it targets with ultra-low fares. But significantly lower fuel prices have upturned that logic. The hub to hub flying that Spirit has undertaken has produced good results, Mr Fornaro stated (the company’s pre-tax margin for 2015 was 23.4%). However, Spirit has been faced with more aggressive price matching on those routes. In 2015 American stated its intent to match the fares of ULCC and LCC competitors, concluding that it could not turn its back on the passenger segment that those airlines target. Mr Fornaro stated that in many ways Spirit has a far-flung network, broadly operating one daily flight in every market. 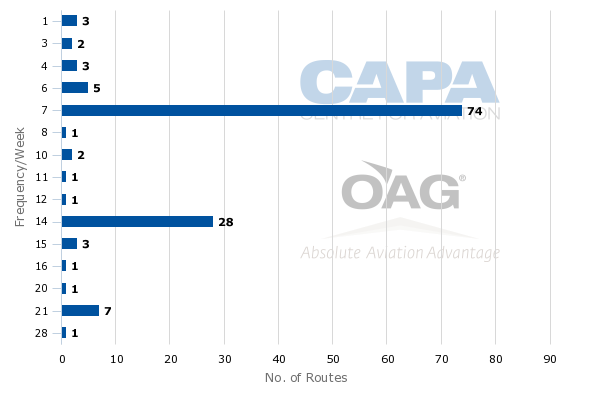 “We cover the entire US, and then when we get off schedule, it’s very difficult to recover.” Data from CAPA and OAG show that 74 of Spirit’s domestic routes feature seven weekly frequencies, or one flight per day. Mr Fornaro said that Spirit will be more open to a broader view of routes, going forward, and over time the airline would be just as interested in the prospects of mid-sized markets. Spirit’s current longer haul routes make a lot of sense, said Mr Fornaro. “But there is also a lot of opportunity in the under 1000 mile [markets] where our cost structure is still very, very relevant and that should become part of the playbook as well,” he concluded. Spirit’s projected average stage length for 2016 is 990m (1,593km). Southwest Airlines also recently highlighted some resurgence in short haul traffic. In Mar-2016 and Apr-2016 it is introducing a few routes with an operational length of less than 500km. Spirit is in the process of updating its five year fleet plan, and Mr Fornaro stated that there are discussions being held regarding gauge and the timing of future deliveries. The airline could opt to retain more of the smaller gauge Airbus A319s if fewer hub to hub markets are featured in its network. 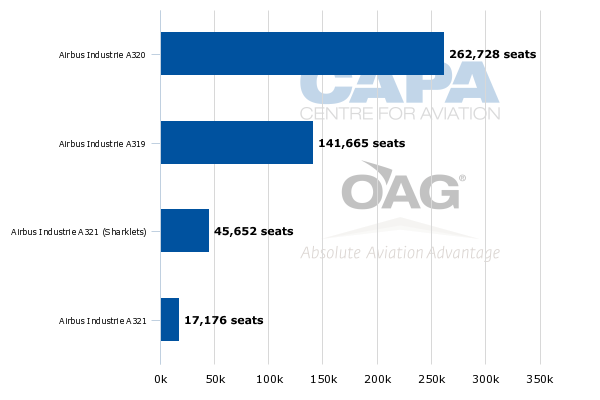 On a system-wide basis, the A319 is Spirit’s second largest fleet type based on seat deployment. But its previous plan was migrating toward more of the larger gauge aircraft to spread costs across more seats. Spirit’s current fleet projections show that it will end 2016 with 26 A319s versus 29 at YE2015. By YE2021, the airline’s A319 fleet is forecast to drop to five aircraft. The bulk of Spirit’s order book is the A320neo; the airline has 45 of the narrowbodies on order. It is too soon to conclude that Spirit may alter the composition of its order book, but there is a possibility the A319 could play a greater role in the future if the airline’s network strategy shifts. Orders include those placed directly by the operator and by lessors assigned to the operator, from 12-Feb-2016 onwards. One of the tactics that the large three global US airlines have adopted to compete with Spirit is fare segmentation. For a couple of years Delta has been offering fare families that feature a Basic Economy option essentially designed to match ULCC pricing. Customers selecting that option have to pay for checked bags, seat assignments and change fees. American and United have both stated that they plan to adopt similar fare segmentation strategies. From the perspective of a larger airline, it is an expensive proposition to match Spirit’s prices, said Mr Fornaro. By moving to a basic economy offering, there is likely to be less price competition. “Rather than, let’s say, dilute half the airplanes, they are going to try to limit it [discounting] to a certain percentage of the market,” Spirit’s new CEO concluded. For Spirit, the key element in managing price matching by major airlines is improving the airline’s reputation and operations, said Mr Fornaro. “As those carriers come down to, let’s say match us, I think what they are going to see is a corresponding improvement in our operation and I think, in that environment, we’ll do fine,” he stated. Spirit has historically targeted visiting friends and relatives (VFR) and cost-conscious leisure traffic. But if the airline is successful in improving its reputation, Mr Fornaro foresees an opportunity among business or corporate travellers who pay for their own ticket; who are not part of a large corporate account. No immediate plans are under way for a product change, but it is a slightly different message being delivered by the airline’s top management. As Spirit begins to examine the structure of its network and fleet, it is forecasting a drop in unit revenues (it does not break out PRASM) for 1Q2016 that will be similar to 4Q2015’s 16% decline. Company CFO Ted Christie stated that although the pricing environment has been stable since Oct-2015, fares in Spirit’s markets remain low, and the pricing environment is still competitive. Mr Christie stated that Spirit’s year on year unit revenue declines should sequentially improve as the company begins to lap the fare decreases that started in 2H2015. Spirit’s full year 2015 unit revenues fell 14.7% and its average ticket revenue per flight segment (this measure excludes non-ticket revenue) dropped 18.5% to USD65.25. That assessment is based on current fuel prices; forecasting gets tougher if oil continues to fall. Spirit’s 30% growth in 2015 combined with falling revenues, and downward margin revisions pressured the company’s stock price as investors for the first time became anxious over what they had held to be a foolproof ULCC model. The company’s new CEO has no plans to grow by 30% in the future, but feels comfortable with a 15% to 20% growth rate. Mr Fornaro does appear willing to examine ways to deploy capacity differently from his predecessor. It would be easy to conclude that Mr Fornaro is using AirTran’s playbook as a model for Spirit. But it is a far different US landscape from when Southwest acquired AirTran in 2010, and Mr Fornaro seems to recognise that fact. There are no plans under way to introduce sweeping changes at Spirit. However, there seems to be a slight refining of the strategy – perhaps a necessary evolution in an environment where sustaining and expanding airline margins no longer just depends on offering the lowest fare.